Located on the western bank of the Rhone river, Ardèche is overshadowed by its more famous (and expensive!) neighbors to the north (Hermitage, Condrieu, Côte-Rôtie) and to the south (Châteauneuf-du Pape is not too far away). However, Ardèche is becoming one of the more exciting wine regions in France for finding reasonably-priced, high quality organic and natural wine, made by enthusiastic young winemakers! Méryl's grandfather was a winemaker in Valvignères, which is the same village where Méryl and Géraldine make their wines today. Méryl would come back on his vacations from university to harvest at a local organic domaine, and it was then that Méryl caught the wine-making bug! Making their own wines for the first time in 2012, they grow the following grapes: Syrah, Grenache, Cabernet Sauvignon, Merlot, Viognier, Grenache Blanc, and Ugni Blanc. The wines of La Vrille et Le Papillon are made organically with some Biodynamic treatments being applied as well. 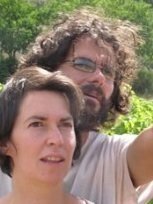 Géraldine and Méryl Croizier can certainly count themselves amongst the best in L'Ardèche, and we are happy to present their wines as a great introduction to one of France's most dynamic wine making areas!